When Facebook acquired Instagram in 2012, many people were confused by the purchase. By all definitions, Instagram seemed to be the antithesis of Facebook. Instagram was small, had little prospect of profit, and was a platform that seemed limited in its image-only medium. At the time, it had a “small” cult following—a mere 30 million users—but that following has since grown to more than 400 million users. Instagram has so far managed to avoid the Big Brother-like quality of Facebook, but that all might change with their announcement of a new algorithm that will alter the image feed from chronological to prioritized. What is an algorithm? How would a change in Instagram’s algorithm change the user experience? Should users be able to opt-out? See the Educator’s Toolbox below for a student worksheet (PDF & DOC) and audio transcript. chronological – arrangement based on time. algorithm – a mathematical way of processing data that is used by a site or app to complete a task (e.g. a formula that organizes your news feed or decides what ad to show you). Big Brother– fictional leader in the George Orwell novel 1984. The term is used to refer to practices of mass surveillance and data collection on individuals by either the government or other organizations. What social media platforms/programs do you use? If you use more than one, why? How do you interact differently with each one? Do you like Facebook’s news feed? Why or why not? Instagram Announcement: “See the Moments You Care About First.” Instagram, 15 Mar. 2016. Reading: Isaac, Mike. “Instagram May Change Your Feed, Personalizing It With an Algorithm.” The New York Times, 15 Mar. 2016. Reading: Nosowitz, Dan. “Could Facebook Swing the Election?” Select All. New York Magazine, 27 Apr. 2016. Video: “How Instagram’s Changes Affect What You See.” USA Today, 28 Mar. 2016. Create a list of the social networking apps you use. List the features of each platform. As a group, discuss and circle the features you love, and cross out the features you think are unimportant. The Facebook algorithm aggregates and analyzes information about the behavior of other Facebook users like you to decide what to show you. Do you think these suggestions enhance your user experience? Which do you think is better for Instagram—a chronological algorithm or a “personalized” algorithm that prioritizes certain photos over others? Discuss the possible advantages and disadvantages of each type. According to a study in the journal Science, we are less likely to encounter ideologically diverse news and opinions on Facebook than we are from mass media, likely a consequence of Facebook’s algorithm for curating news feeds. How could prioritizing our feeds affect our opinions and worldview? How could only exposing people to worldviews similar to their own affect race relations and politics? How could social media sites and apps use prioritizing algorithms while still promoting an exchange of ideas and opinions? What should the role of a social media site or app be? Develop a mission statement for a social media platform based on what you think its role should be. —Is everything collected into one app or site, like Facebook, or over separate ones? —Are your feeds prioritized or chronological? —How much control should the user have over their experience? —REALITY CHECK: You need to be profitable. Does your site work for advertising? How can advertisers target users in your platform? According to Hilary Mason, priority algorithms in social media feeds “…choose to bias the things that you see by what people like you actually do and how they behave.” Decide whether you think Instagram should change the organization of its feed from chronological-only to one governed by a priority algorithm. Discuss the benefits and possible drawbacks to the user. —Explain the user experience they anticipate based on their chosen algorithm (chronological or prioritized). —Dvorsky, George. “The 10 Algorithms That Dominate Our World.” Io9. N.p., 22 May 2014. —Greenberg, Julia. “Like Facebook, Instagram Is About to Go-Gasp-Algorithmic.” Wired, 15 Mar. 2016. —Arthur, Rachel. “#Turnmeon: Instagram’s Algorithm Changes Have Fashion Brands in a Tizzy Too.” Forbes, 29 Mar. 2016. —Brueck, Hilary. “Instagram Asks Everyone to Calm Down After Algorithm Uproar.” Fortune, 28 Mar. 2016. —Bakshy, Eytan, Solomon Messing, and Lada A. Adamin. “Exposure to Ideologically Diverse News and Opinion on Facebook.” Science. AAAS, 05 June 2015. —Sunstein, Cass R. “How Facebook Makes Us Dumber.” Bloomberg View, 8 Jan. 2016. —Rhodan, Maya. “Facebook Study Says Users Make Their News Feed Less Diverse.” Time, 7 May 2015. Web. —Barrett, Brian. “Put Down the Pitchforks-A Twitter Algorithm Won’t Ruin Anything.” Wire., 8 Feb. 2016. Have students compare one article’s assessment of the user experience with their own for a given social media app. 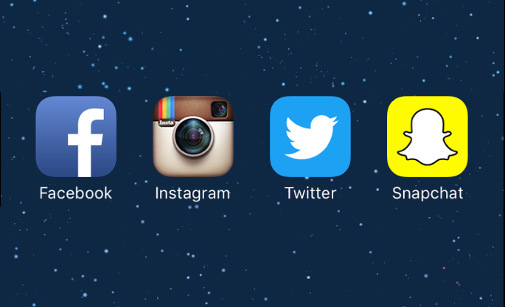 Are these social media apps and sites represented accurately? Where did they get it right? Wrong? How Can Virtual Reality Plug In to Social Media? More immersive media could help us forge deeper digital and real-world connections. Why did Instagram’s announcement of a new way of filtering its photos set off a public outcry?